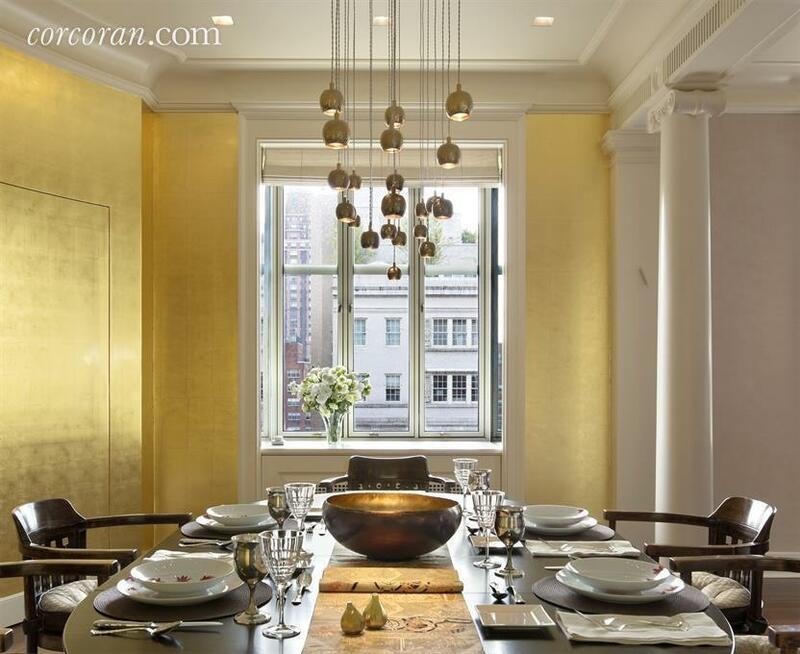 Talk about a selling point: This apartment, located in the Upper East Side co-op building 820 Park Avenue, has been personally redesigned by starchitect Robert A.M. Stern. 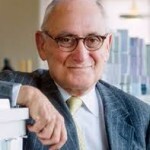 He is well known for his project on the other side of the park, 15 Central Park West, where he designed a condo reminiscent of the historic co-op towers along the park. Here, he’s taken a prewar co-op, which fills up the entire 12th floor, and added some modern luxury perks. 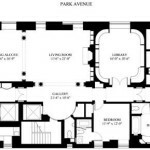 The apartment itself has an interesting history; it was originally configured as a triplex for the building’s owner, and was then owned by pharmaceutical giant Cheng Ching Wang, the late father of Vera Wang. Serena and David Steinberg (she’s the daughter of Houston-based real estate mogul Gerald Hines, who’s built projects designed by I.M. Pei, Frank Gehry, and, of course, Robert A.M. Stern) purchased this floor for $6.5 million in 2008, pre-reno, and subsequently brought on Stern. 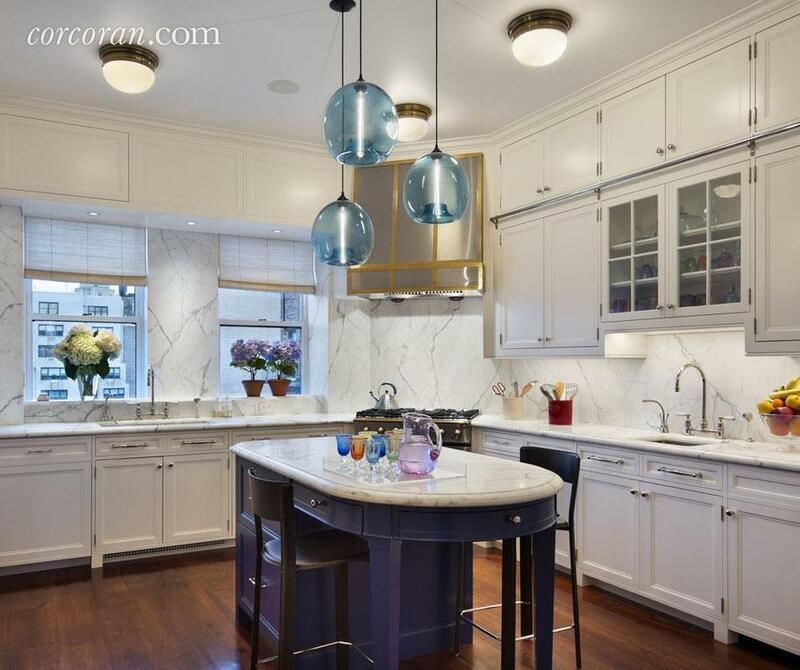 After such a grand renovation, the owners started seeking a hefty profit back in 2013, originally listing it for $16.5 million. 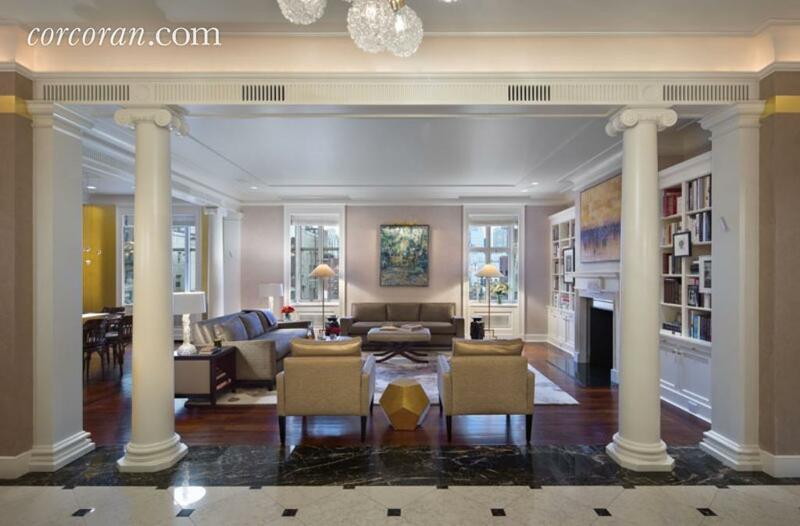 Now, after several price chops, it’s back for a much-reduced price of $9.5 million. Stern had a lot of space to work with here, with ten total rooms, four bedrooms and four bathrooms. The entrance foyer opens into the living room, which is flanked with columns, and the adjoining dining room. A closer look inside the living room. Prewar details, like the fireplace, remain intact, but the built-in shelving looks like a new addition. During the renovation, the walls were specially reinforced to support art. Other upgrades include soundproofing, millwork custom-designed by Stern, automated shades and lighting, and environmentally-friendly air conditioning and water filtration systems. 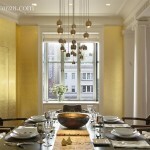 Gold paint to distinguish your gorgeous dining room? Why not! And custom hanging lighting to match. 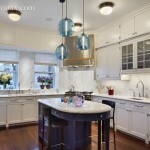 The kitchen renovation was also top-of-the-line, with SubZero refrigerators and a wine cooler, a cooking range with a matching venting hood that was specially designed by Stern, two sinks, a big pantry, and finally a work area with a desk. We love the modern lighting throughout the house. 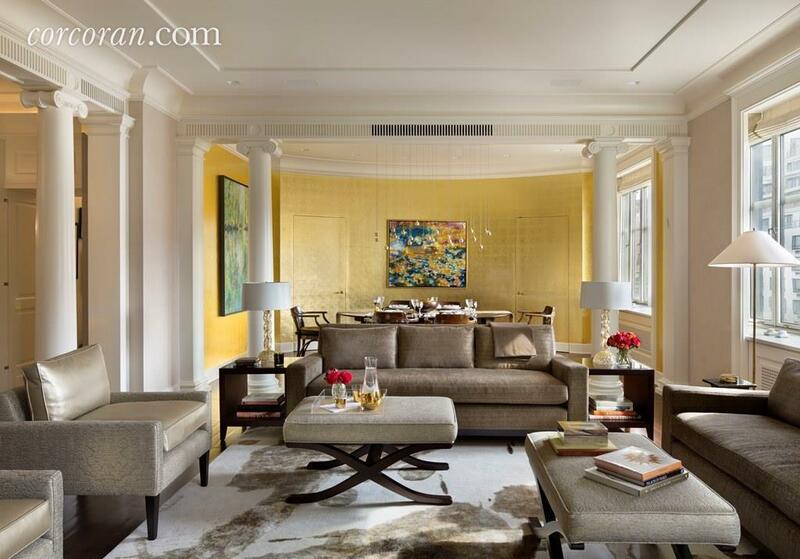 What’s an Upper East Side co-op without a very fancy study space? This walnut-paneled library has curved bookshelves and a brass-and-walnut ladder rail system to access the floor-to-ceiling bookshelves. There’s also hidden storage encircling the room. 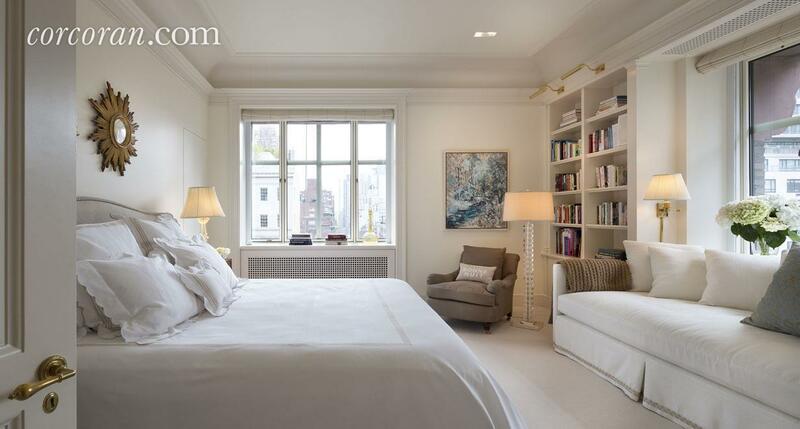 From the master bedroom, there are views across Park Avenue. Don’t forget massive his-and-hers walk-in-closets (the “his” closet is walnut, “hers” is pale-burled maple, according to the listing) as well as his-and-hers bathrooms with radiant heated floors and a separate sitting room. Life doesn’t seem so bad in a starchitect-designed luxury co-op, now does it? I guess if you’re into cheesy columns, curved walls and lots of gold and yellow paint/wallpaper…but I think Mr. Stern should stick to his day job designing magnificent neo-pre-war condo towers, as he’s apparently much better at doing outside of a building than he his at doing the inside of an apartment.